An old joke in the development community goes like this: the first 90 percent of a project takes 90 percent of the time, and the remaining 10 percent takes the other 90 percent of the time. It's a joke, of course, and with the rise of agile development and cloud computing patterns, the notion of the last 10 percent may be a thing of the past. But the question still remains: How do devs spend more time on what makes their app different and unique, and less time on plumbing and infrastructure? Taking advantage of the right cloud solution can be a big step in the right direction. The right solution can help cut down development wait and integration time. A flexible infrastructure enables developers to spin up resources quickly, run the most popular solutions with cloud-level agility, and use prebuilt APIs and connectors to streamline development processes and get projects off the ground. 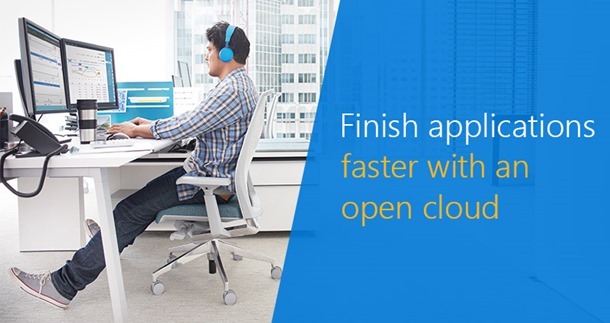 See how quickly developers can deploy apps in Microsoft Azure. Tomorrow's apps will be built in a fundamentally different way that requires flexible tools and infrastructure. As part of this evolution, it will be important to be able to spin up apps quickly on Linux virtual machines or Docker containers and blend multiple data types. In addition, it’s critical that systems support different storage types and the ability to incorporate big data. The right cloud solution means an infrastructure that's flexible enough to meet developer needs while being available on demand, anytime, anywhere. That flexibility allows developers to focus on development work and use the tools that they want to use, and not be shoehorned into a limited tool set. To cut down development time, find a cloud provider that offers a rich ecosystem of end-to-end solutions. Developers leveraging open source technologies should be able to work with the tools they love, right out of the box. A cloud service should pack in support for stacks such as Cassandra, MongoDB, MySQL, and Hadoop. But that's just the beginning. It also needs to seamlessly integrate with existing apps and data storage solutions, so devs aren’t wasting valuable development time trying to make things work together that should already work together. Developers should feel empowered by their cloud solution to program what they want in the way they want. Support for PHP, Java, Python, and Node.js, on iOS, Android, and Windows devices, is a must. Whatever the platform and whatever the tool, developers' productivity should be enhanced by their IT environment, not hindered by it. The last consideration is the ability to streamline development processes, so coders can focus on coding, not operational tasks like building APIs, databases, and connectors. Rapid building, deployment, and management of applications mean devs can do what used to be “the last 10 percent” continuously throughout the development process. Robust cloud solutions provide prebuilt APIs and connectors to automate processes, and work with the tools devs choose, such as Git, Jenkins, Puppet, and Chef, to support their development process. That way, developers stay on the front lines of innovation and creativity instead of spending time on tedious operational tasks. Choosing the right cloud solution—one that supports open source collaborative rock stars—will free developers to do what they do best: get to the finish line faster and be creative. It will provide flexible tools and infrastructure, provide a rich ecosystem of end-to-end solutions, and help streamline development processes by automating operational tasks. Soar through all 100 percent with as few bumps as possible, with a cloud solution that sets developers free to be the best they can be. Watch how devs handle load balancing on Microsoft Azure.